A project created to support the mission of Father Emilio Balliana, a Camillian missionary in Kenya who began his work on the shores of Lake Victoria in the district of Karungu, welcoming children affected by AIDS, orphans of parents killed by the same disease. Recently appointed Knight of the Italian Republic by the Italian Ambassador in Kenya, Father Emilio is a tireless defender for children’s rights and has made the completion of a large number of social projects, including health care and education possible, including the latest creation, the beginning of the construction of a water system and the training of 10 artisans who will construct the main sanitation services in the region. COM&C. 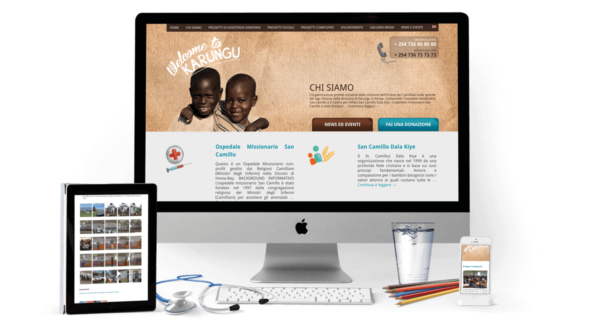 has chosen to support pro-bono the mission in Karungu by creating its website and remotely coordinating the activities of the local collaborators who keep it up-to-date.